Il campeggio Camping Manon è dotato di 50 piazzole itineranti. In bassa stagione, nel periodo 20-03-2019 - 05-07-2019 e 25-08-2019 - 31-10-2019, è possibile soggiornare a soli €18,- a notte in una delle 50 piazzole itineranti del Campeggio Manon di Orange (Vaucluse). Oltre ad offrire prezzi vantaggiosi ai titolari della CampingCard ACSI, il campeggio accetta anche l'ACSI Club ID (sostitutivo del documento di identità). Patrick offre un cordiale benvenuto in questo piccolo camping tranquillo vicino all'Arc de Triomphe e al centro di Orange con, fra l'altro, un antico teatro romano. Con il sole 300 giorni all'anno, è adagiato all'ombra dei pini e dei cipressi. 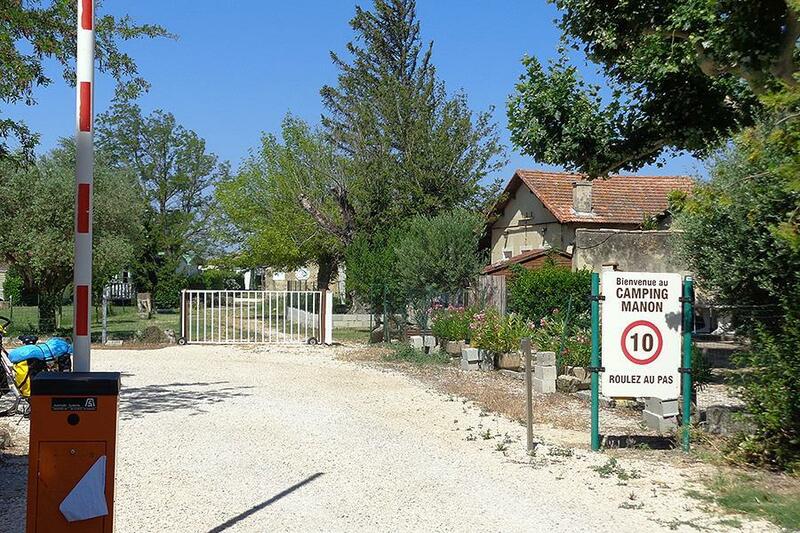 This campsite is convenient for visiting the pretty town of Orange and we have stayed on several occasions. However the site has deteriorated in the last 12-18 months, no lighting at night, security fencing broken and no staff on site at night. These situations, I feel resulted in the theft of several cycles on the 2nd or 3rd of October and resulted in the events on the night of the 6/7 of October when several motor homes were broken into including ours, and many items taken. If this was not bad enough, the campsite staff seemed indifferent to our situation and did not even speak to us to offer help or support. We will not be using this campsite again unless it is improved dramatically. The campsite is pleasant with good size pitches, we stayed in early October and the pool was still open which was good. The site is easily accessible to Orange but is also close to a run down neighbourhood. Site security comprises a vehicular barrier and a camera. On our second night, we, along with several other mobile homes, had burglars enter our campervan and steal some money. Additional security in terms of better perimeter fencing and better lighting near to the pitches would be an improvement. Stayed for two nights to visit Orange, lovely site and private, sheltered pitches. As others have said showers are a bit dated, but they are clean and plenty of hot water. At the time of our visit they were doing a lot of work, which looked like another small shower block and fitness area (under construction). It was an easy walk into and around Orange (not a bit town), a visit to the Roman Amphitheatre is a must. Also Aldi supermarket five min walk away, would use again as good stop over site for visiting Provence. Good campsite you can tell it was a municipal site, good pitches and on the ones near us good hedges that had obviously been there a long time. Receptionist very friendly and helpful, site in great position for visiting Orange which is very good city to visit. The only drawback are the sanitary facilities, which were very well cleaned by the person responsible but it is a loosing battle because of the condition of the showers, tiny worn out cubicles & the smell from the sewer when water as running was sickening no hot water in showers just lukewarm and like many campsites in France no hot water in washbasins. The chemical toilet had to be emptied into the grey water drain so no flush system, glad I wasn't on the next pitch it got quit smelly, nearest fresh water was the washing up mixer tap, not very ideal. Would love to go back to see an opera in the amphitheatre and see more of the city. If only this campsite upgraded its sanitary facilities it would be a superb campsite. Poor directions to the site. Allocated pitches of varying sizes. Dog faeces at the base of a fresh water tap. Broken tiles on shower floors. Tiny showers and toilets. Splintered glass panels in sanitaire entrance. Good Aldi within walking distance. The Roman arc de Triomphe and the town with its outstanding Roman theatre are well worth visiting to those interested. The town is pleasant and friendly with good restaurants. Since this seems to be the only camp site within walking distance of the town and its attractions, it can be recommended - but for this reason only. Needs care and attention. Visited in early June 2017, finding the site was a bit tricky as the directions were poor, for a site located in the city outskirts. Reception was efficient, but our pitch was allocated and was a bit cramped and tight to manoeuvre onto. The toilets were clean but a bit dated although no problems were experienced. Good stopover location for walking into Orange, but not such a good holiday destination for longer stays. Volete prenotare il Campeggio Manon o oppure saperne di più? Potete farlo usando i seguenti dati. A7, uscita Orange-Centre (alla rotonda del McDonald's a sinistra e dopo il liceo a sinistra), quindi seguire i cartelli in direzione Le Jonquier. CampingCard ACSI invia la tua richiesta di informazioni al "Campeggio Manon".